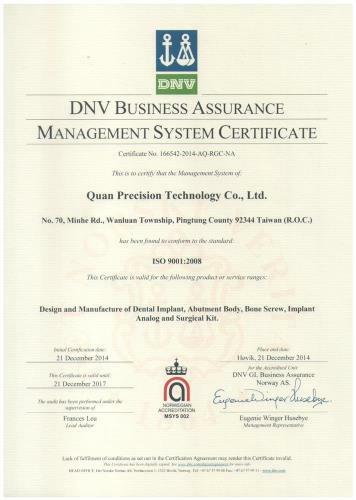 Quan Precision Technology Co., Ltd. is a professional and certified company,the main services as "CNC machining, laser engraving foundry, titanium chrome anodizing...etc.、 Mamedical equipment (dental / orthopedic) product design and development, and manufacturing. Our team is committed to the research of the technology industry in 2008, has reached a certain level of expertise. 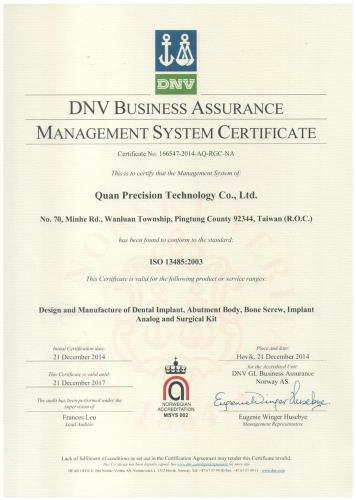 The company has achieved ISO 9001 and ISO 13485 international quality system certification. 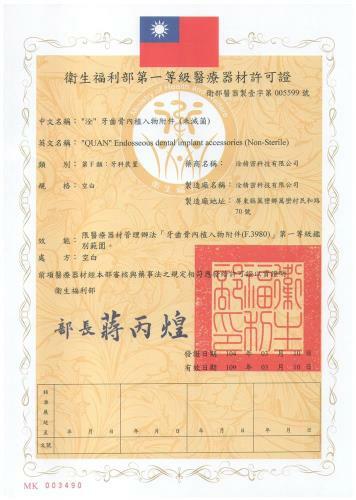 We have made medical equipment manufacturer in Taiwan license compliance certification, and certification by the US FDA 510K local companies assessed as qualified product design, manufacturing suppliers. Quan Precision Technology Co., Ltd. to meet customer demand for product design, development, and actively develop more advanced process technology to help customers access to innovative and improve product performance. The manufacturing process of the product are fully compliant with ISO 9001 and ISO 13485 quality system monitoring, and escape the burden of high cost of large companies, providing clients with the price and professional service. Quan Precision Technology Co., Ltd. sincerely welcome doctors, dealers (distributors) to discuss cooperation mode ! !